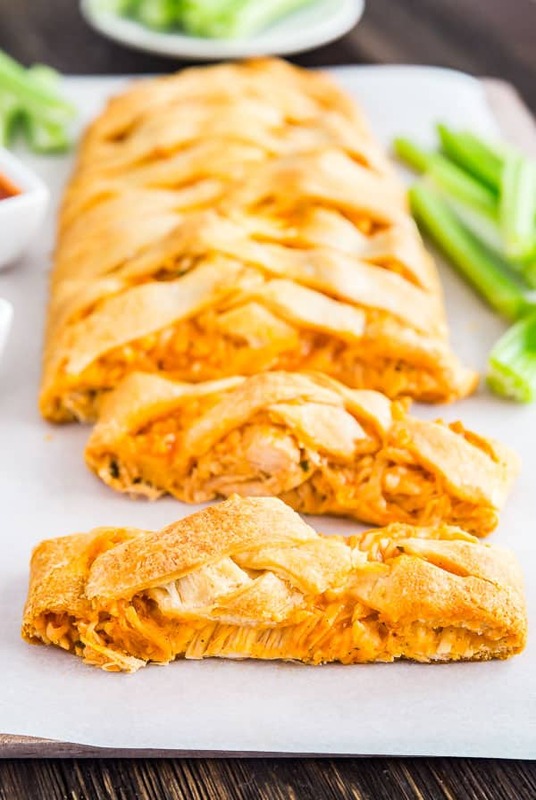 You will not believe how easy this Buffalo Chicken Braid is to make! 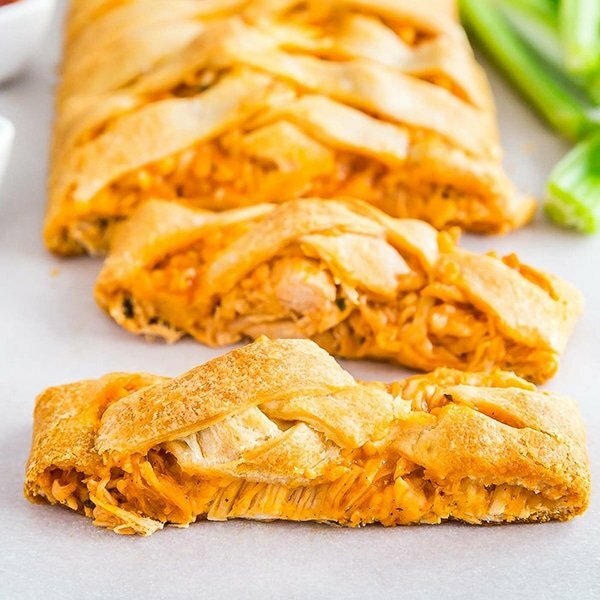 This is a proven crowd pleaser- your family will be fighting for seconds! When it comes to snack foods, I also cannot get enough of salty, delicious, extremely naughty snack foods. I think that’s why game day foods have my whole heart And it’s not game day without something involving Buffalo Chicken Wings. I mean, Buffalo New York is right in our backyard. So this recipe was absolutely necessary. I mean, what’s not to like? 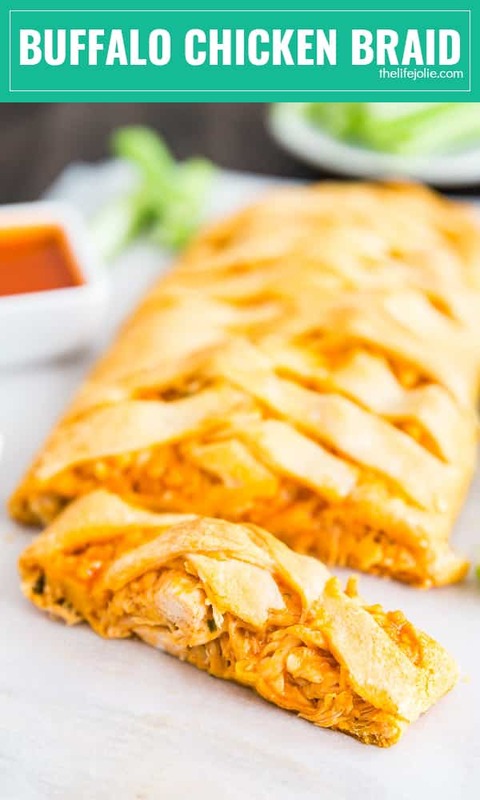 Spicy, savory buffalo chicken (it’s basically an easy buffalo chicken dip), with mozzarella cheese and enveloped in tender crescent roll dough. Carbs make everything better (I know we’re not supposed to talk about carbs this early in the yea so we’ll pretend I never said that). But seriously, this was so stupid-easy to make and was really tasty! You will, without a doubt, be the most popular person at any party or potluck that you bring this to. This is real talk here, people! J requests this for every single food day they have at his work. Trust me when I say you’ve got to make this! You can control just how spicy it is by reducing or increasing the amount of sauce, which is why I gave a range in the recipe. Taste it as while you’re mixing the chicken filling. If a crescent roll sheet isn’t available (my local grocery store recently stopped carrying them and I’m SO bummed!) 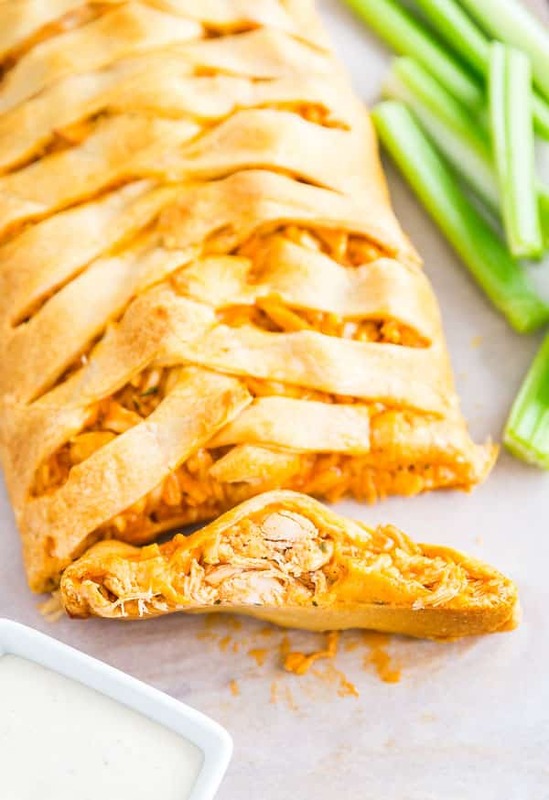 you can use crescent rolls- carefully unroll them and leave them in a rectangle. Use a rolling pin to roll them together so that they’re one sheet. 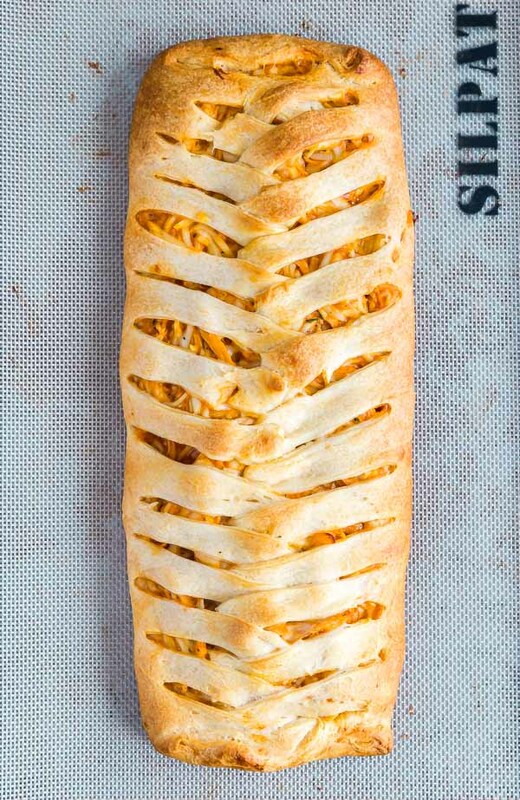 You’ll want to be extra careful when braiding the dough. When cutting the dough strips that you’ll be braiding, I prefer to use a pizza wheel – I’ve also used a knife but the pizza wheel makes it so much easier! 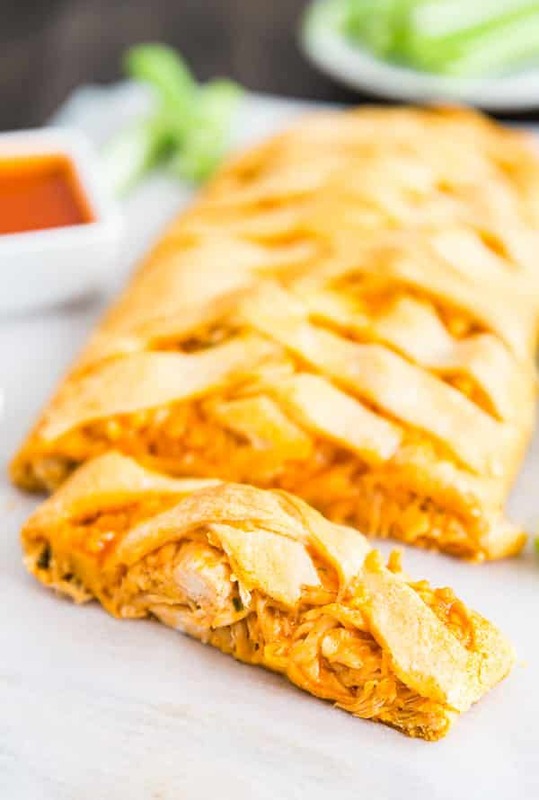 You can make this ahead and refrigerate it on your sheet pan until you’re ready to serve; it tastes great warm or cold (though I’ll admit, fresh out of the oven is better- so maybe assemble and bake it off right before serving). 1/2 - 1 cup buffalo wing sauce- make sure it's buffalo WING sauce not regular hot sauce (the more sauce you add, the spicier it will be- so start with a 1/2 cup and taste it- add more sauce accordingly). 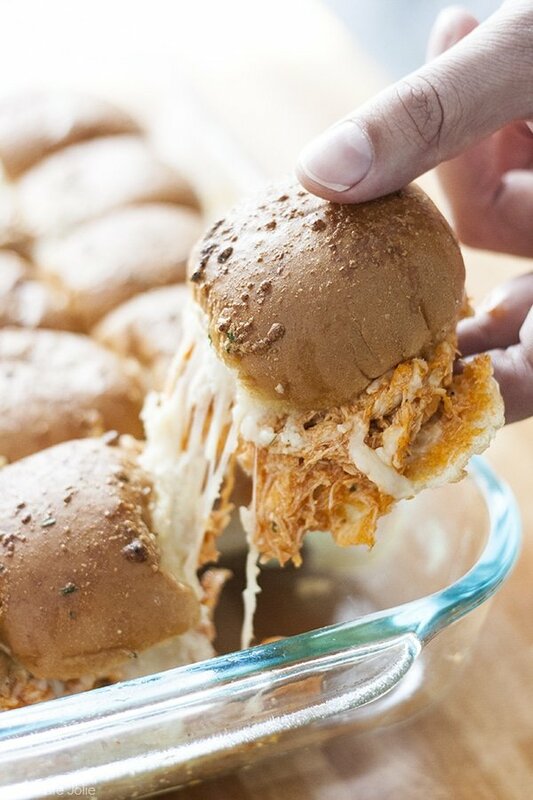 In a bowl, mix the chicken, ranch seasoning, Buffalo wing sauce and mozzarella cheese and set aside. 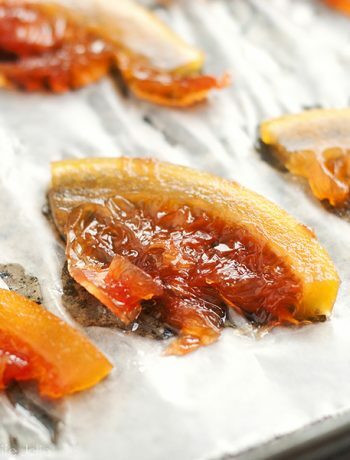 Place the crescent sheet onto the a silicone baking pan liner or piece of parchment paper and roll it slightly to flatten (you don't want it too thin). Transfer the liner or dough to the sheet pan. Using a pizza wheel or knife, cut strips about 1 1/2 inches into each side, leaving around 3-4 inches of dough uncut on the inside. Place the chicken mixture down the center where the dough is not cut. Take the strips and fold them over each other, pressing lightly in the middle to create the braid. Fold the ends in to hold in the filling. Bake for around 30-35 minutes or until golden brown. Serve immediately or refrigerate and reheat when ready to serve. It can be difficult to transfer this from the pan to the serving platter or cutting board. I found the easiest way to do the transfer was to loosen it underneath with a spatula, invert it onto another pan and then invert that onto your platter or cutting board. Just be gentle and it shouldn't alter the appearance. 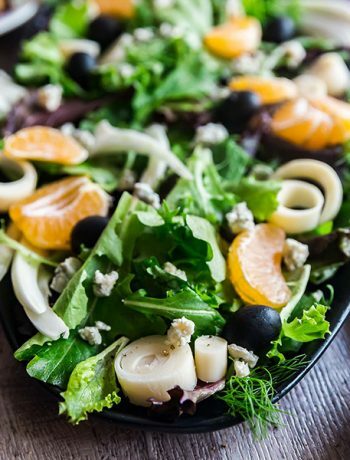 October 5, 2015 at 11:22 am Thank you- it was really delicious! October 5, 2015 at 11:49 am We learned to do these from my wife's days as a Pampered Chef consultant MANY years ago. They are so good and we still make them! Scott recently posted...Is Your Mouth Killing Your Chances? 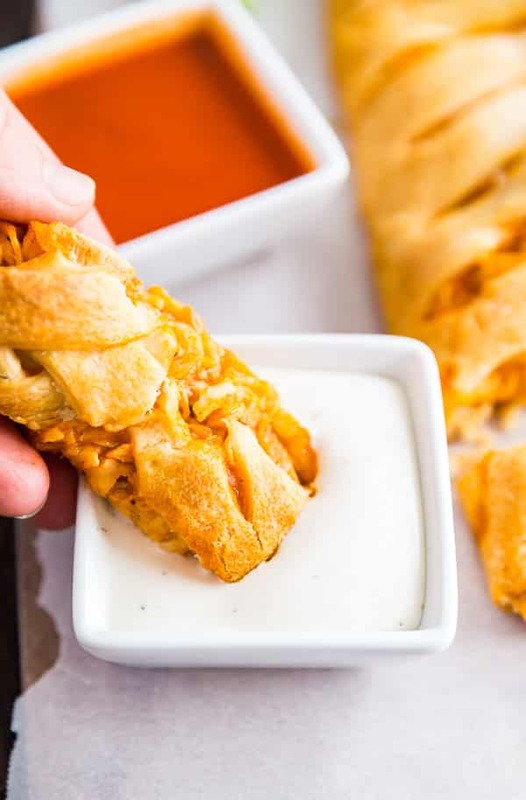 October 5, 2015 at 12:25 pm I love a good quick and easy appetizer! December 17, 2015 at 9:45 pm This looks amazing and so easy- I love the versatility of it too- changing up the filling but keeping the braid- great idea and it looks kind of nice! December 21, 2015 at 11:42 am Thank you- it definitely goes fast! My husband requested two for his company potluck on Wednesday! 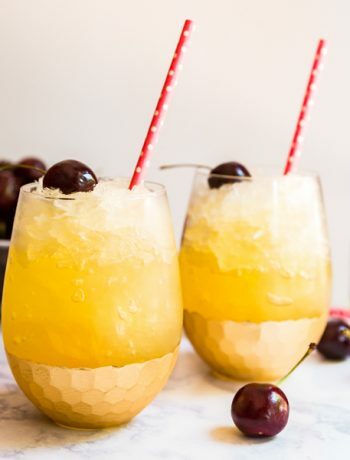 January 9, 2018 at 12:31 pm Seriously craving this! January 14, 2018 at 10:35 pm It's dangerously addictive! January 9, 2018 at 2:37 pm That braid is impressive! Great video! January 14, 2018 at 10:35 pm Thanks Megan! April 2, 2018 at 10:07 am This is beautiful idea ! Crowd pleasing; pinning !